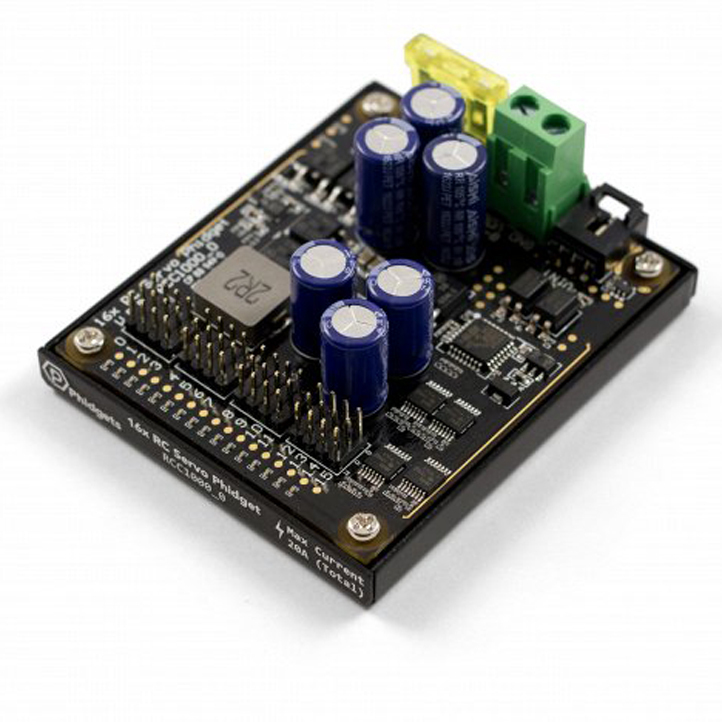 Perfect for robotics projects, this impressive Servo Phidget can control up to 16 RC servo motors independently from a single port on your VINT hub (See the Comaptible Products tab for a list of hubs). It is powered externally by a 8-30V supply, providing a total of up to 20A of regulated power to its servos. You can control the regulator and choose a global voltage of 5.0V, 6.0V, or 7.4V. A servo will have more torque when running at a higher voltage, but will have a shorter overall lifespan. Check your servo's data sheet and balance the voltage for your specific application. You can control the position, velocity and acceleration of each servo motor with non-blocking methods in our API. 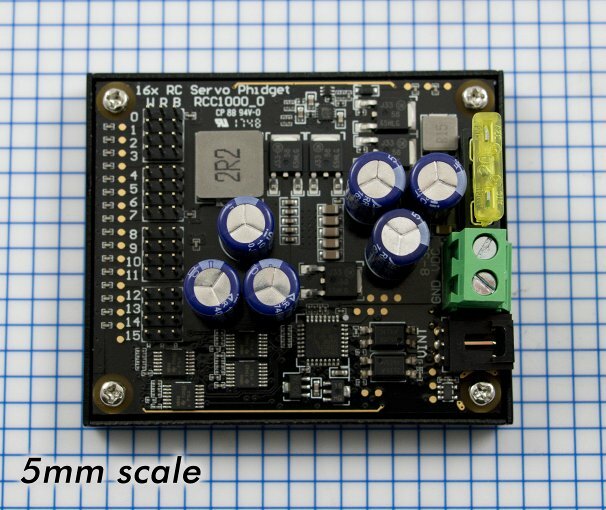 You can also set the minimum and maximum pulse width for each servo, and the actual position they correspond to. This allows you to use a wide variety of servos, not just the ones sold here at Phidgets. This Phidget comes with a number of safety features built-in. The power terminal has polarity protection, so you won't fry your board or your servos if you connect the power supply backwards. The voltage regulator that converts the 8-30V to the user specified voltage will automatically limit the current to a safe level, and a fuse protects the device from power surges. The VINT port is electrically isolated from the rest of the board, making it simple to build a reliable, high-current system.